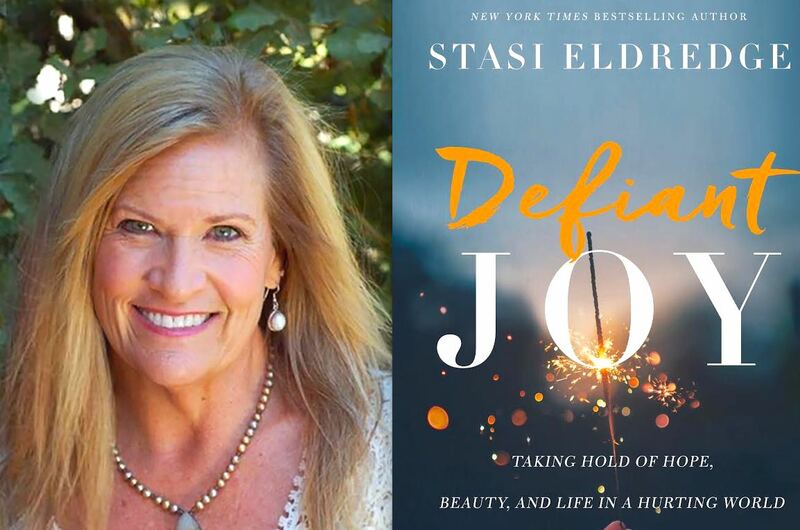 In her new book Defiant Joy, Stasi Eldredge (also author of the best book ever, Captivating) meets readers in their painful realities and offers an invitation to a joy that is defiant in the face of this broken world. This joy does not Pollyannaish-ly ignore life's heartache; rather, it insists that sorrow and loss do not have the final say. This kind of joy is present to both goodness and grief and interprets them in the light of heaven. With deep vulnerability about her own chronic pain, surprising diagnoses, and relational struggles and loss, Stasi demonstrates how to maintain a posture of holy defiance that neither denies nor diminishes the pain, but instead leans fully into the experience of knowing God's presence and promise in the middle of whatever life may bring. Difference between happiness and joy? Happiness is a wonderful feeling that is based on our circumstances. We are so happy when things go our way, when we are surprised by something good or when things go well for one we care about. The difference between joy and happiness is that though happiness is circumstantial, joy is not. Joy is rooted in eternity – in the finished work of Christ – in the Kingdom of God that is always available for those who are tapping into the resources of Heaven. Happiness may come and go but joy is deeper, steadier and made of a substance that can be known no matter what is going on in a person’s life. Who did you write "Defiant Joy" for? I wrote Defiant Joy for people who long to experience more joy in their lives. I want readers to discover a joy that is unwavering, steady and available even in times of trial, pain and grief. It is my hope as well that readers will walk away from the book with a deeper rootedness in the steady love of God. How does "Defiant Joy" compare to your other books? Defiant Joy is my most personal and vulnerable book yet. It was written in what was one of the most painful years of my life and I am very honest about that. I share what I was going through and the incredible hopeful lessons that God gave me as He met me in the pain. Defiant Joy is similar to my other books in that it is written to draw others to Jesus and to honor the story of their lives – and to find Jesus in the every day. Did you grow up planning to have a ministry & write books? Great question. And no. But like everyone else, I longed to live a life of impact! I had an innate bent to lead from an early age and a desire to make the world a better place. I also had a strong call to be an advocate for women early on. I became a Christian in college and led Bible Studies and facilitated small groups and taught Sunday school as soon as I could. The desire to lead retreats didn’t come until my 40’s and later still to write a book. I always wrote – journaling, stories but a book? That came much later. So to answer your question, I grew into all of it slowly but surely as I grew in knowing our amazing Jesus. You mention struggling with depression & food. How did you overcome? Prayer has played an enormous role in my healing journey. It’s a powerful tool given to us to tap into the Kingdom of God and the resources of Heaven available to us. Diving into the Scriptures has been key as well. Meditating on the truth of who God is and who He says I am (regardless of how I feel) is powerful and redemptive. I’m also a big believer in counseling. With the right counselor, huge healing can take place as we study the story of our lives and invite Jesus into it. There is also a great good to be harnessed in the medical field. Whether through a naturopath or a doctor, I’ve sought help at various times in many of the ways that are available to strengthen my body, my emotions, my hormones and my serotonin/dopamine levels. We are body, soul and spirit and I have pursued Christ in every area. God is merciful. God is kind. God’s love isn’t up for grabs and doesn’t change based on how we are doing on any given day. Having that truth penetrate my heart has allowed me to grow in treating myself the same way. That bears very good fruit. Advice for young women waiting on Mr. Right? I would encourage her to PRAY FOR HIM. Not just to pray for him to come her way (but do that too), but to be praying for his protection, his walk with God, his union with Christ and anything else God leads you to pray. I would also encourage her to pursue Jesus and the particular calling He has on her life and not to wait to engage in it until her man comes along! Live your life. Pursue Jesus. Pray for your man. Ask other people who love you to pray for him too. And then open your hand in trust-filled surrender to Jesus. It’s hard to wait. It’s hard to want and not see the answer on the horizon. But keep your heart alive. Risk wanting. Risk asking. Don’t settle. That’s a hard question. The easy answer is to put my trust in Jesus and give my life to Him. I took that advice. Best thing I ever did. Later, it was to pray to love Him more…to ask Him to expand my capacity to love Him. That turned out to be a hard prayer that bore much fruit. The more I love Jesus, the more I am able to love others. More practically and regarding being a writer, the best advice I was given was to read good books. Lots and lots of them.